Little Rays of Sunshine! : Sew what! So I did it! I got a fabulous sewing machine from Chris for mothers day and I put it to use right away. 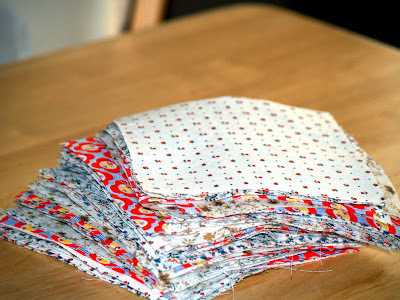 Sewing dresses for all the neighborhood kids, aprons, quilts, and even a wedding dress or two! 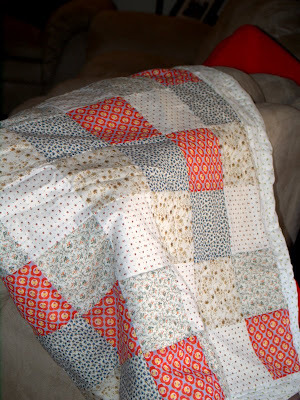 K maybe not, but I did make a quilt. Just one. Making it was so fun and easy for someone who's very domesticated and great with the needle like myself.....NOT!! But truth be told it actually wasnt as hard as I thought it'd be. Well the top was easy i'll just say that, after that we'll just leave what happened between the sewing machine and myself. (Anyone ever seen the friends episode where monica gets stung by the jellyfish?) lol And although it required some major nip tuck action towards the end, I'm pretty proud of my first sewing project. Looks awesome.. never would have guessed you were a beginner. Denee you are just one of those people who is naturally talented. Hey great job!! I made a quilt a couple of years ago and it is a blast. I know the end is very tricky, but it was so worth it. My mom got me a sewing machine this past christmas and I haven't used it yet, I'm dieing to but I don't know what to do, or how to begin. Anyway, the material you used was super cute. Great Job! Oh my gosh Denee! Good job! MAKE ME ONE! haha! I never thought you had it in you..haha...this mom thing is really changing my old friend. Your like a house-wife now! haha! THAT IS SOOOO GREAT! My mother in law makes fabulous quilts so I thought I would have her teach me. Well, long story short...she took my fabric home and just did it for me. ;P Your quilt looks AWESOME! That turned out perfect! Great job! !